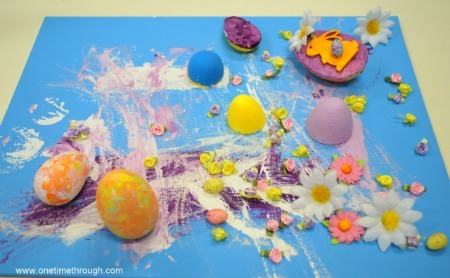 When Tinkerlab presented their creative challenge for the month of April (to have your child use eggs in an art project), I asked my son, Onetime what he wanted to do with the foam eggs that we had. His answer? 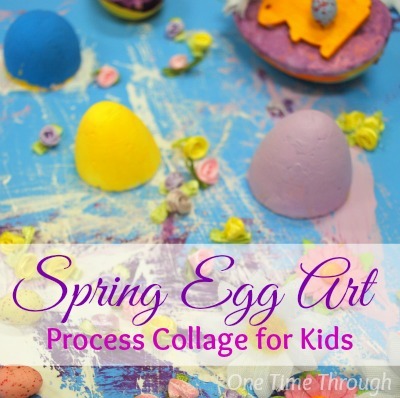 “Paint with them!” And so… here is our second entry to Tinkerlab’s egg challenge – “Eggy Art: 3D Collage!” Onetime had SO much fun with this and I think the end result is stunning! 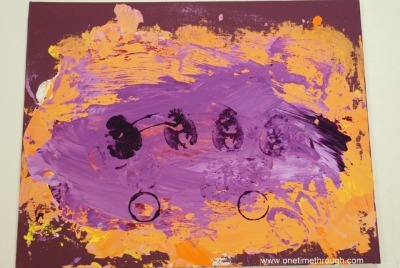 Before Onetime (my 2.5 year old son) began, I painted the two canvases with solid colours. 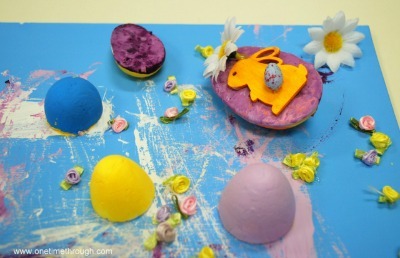 I also carefully “sawed” several of the foam eggs in half using a bread knife. To make it easy for my little guy to paint with them, I glue gunned some popsicle stick holders onto their back. 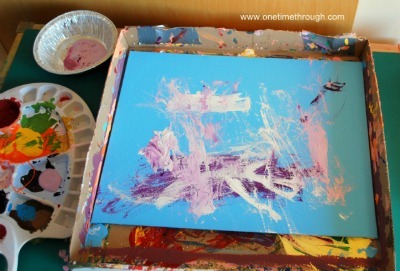 This project really allows your child to create 2 separate projects! 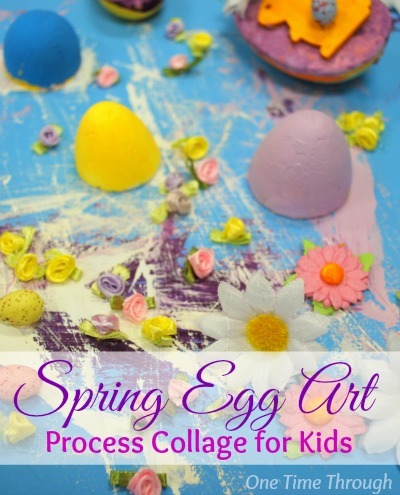 The first involves painting with the eggs and the second involves painting with feathers and then gluing on the eggs that were used to paint with! 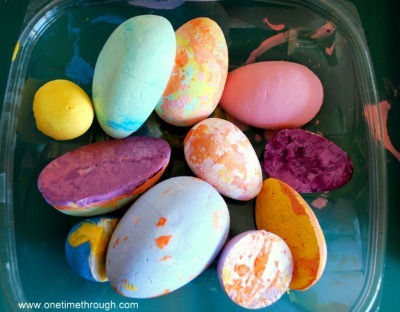 Present your child with several whole foam eggs, as well as eggs cut in half both vertically and horizontally. Provide paint! Watch them create! Here is a car Mommy. I’m washing the car! 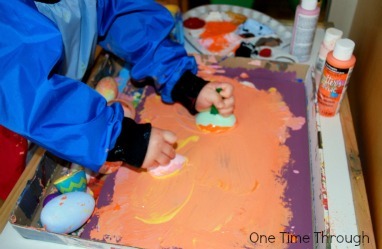 Onetime enjoyed spreading the paint with the egg halves and mixing different colours. He then experimented a bit with printing the egg half shape and rolling whole eggs around. Then back to spreading! I’m getting my car clean. As good as new Mommy! 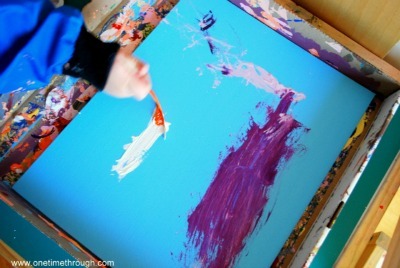 Double-fisted painting is lots of fun and great for spreading and mixing paint! To let the orange paint dry for a bit, we took a break, then came back to our work with different colours! Here was Onetime’s finished Project 1! “Clean Car with Windows” was Onetime’s title for this piece! To begin the second project, Onetime used feathers to paint a background using pastel colours. 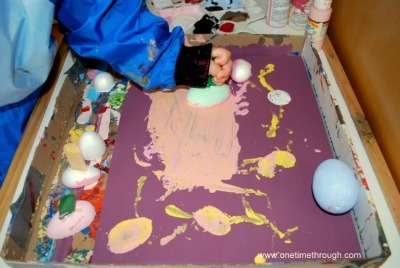 Now for the FUN part…the eggs and egg-parts that were used in Project 1 were now hot glued onto this beautiful background. Because they were painted with, they were now gorgeously coloured and ready! 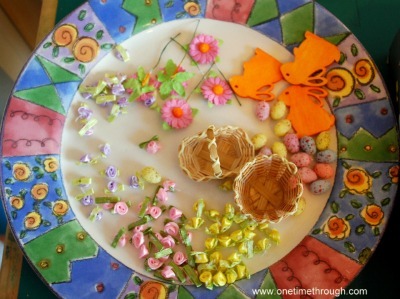 I also showed Onetime all the awesome spring decorations he could add to his artwork. 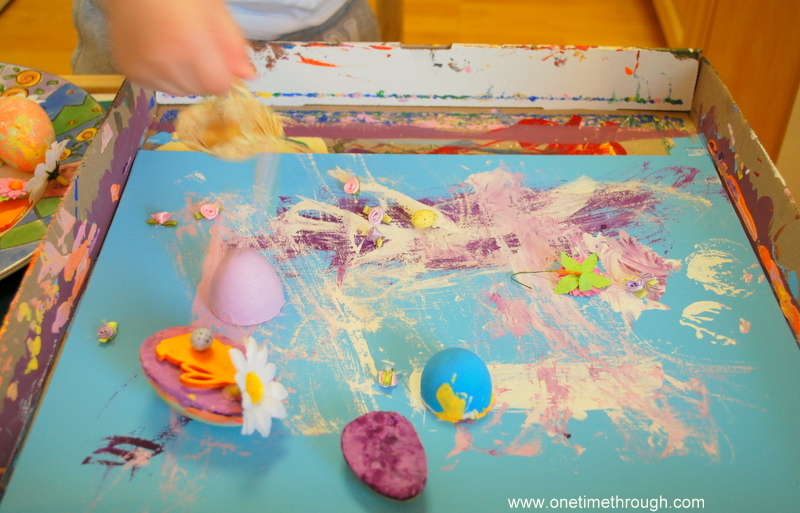 To add the decorations, Onetime picked out the egg or flower he wanted and pointed to the spot where he wanted glue and I would apply the glue. 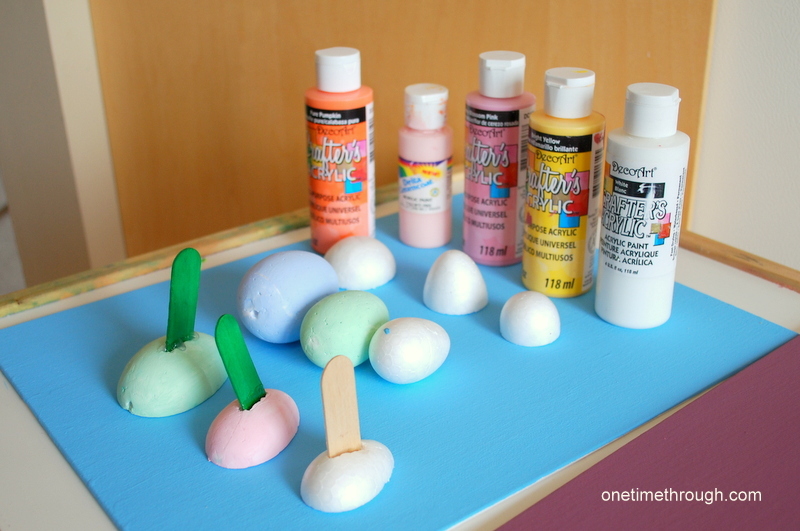 Next, Onetime glued on other egg parts and mini-eggs. I love how he placed some vertically and some horizontally! To decide where the little flowers were going to go, Onetime put them in the little basket I had provided and “swooshed” it back and forth over the painting until they fell out. He asked me to glue them where they fell. VOILA! Absolutely stunning 3D art created by a 2.5 year old! I LOVE this piece and it now has a very special place on our mantel and I’m sure will be a favourite Easter decoration for years! My favourite part about these projects was how much enjoyment my son got out of them. He was really focused on the process of creating – one of Tinkerlab’s criteria for this challenge. Although my son’s finished project #1 is not my personal favourite – he is very proud of it and has pointed to it a number of times since he did it and described the car that he “washed” and painted. 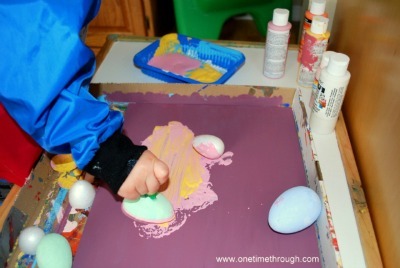 He also really liked being able to spread the paint with the egg-halves – much easier for him than using a paint brush. Hope you liked our double project this week and give it a try! I would LOVE to hear how it went if you give this a try with your child! Thanks Kate! Just finished posting a link to your site over here! 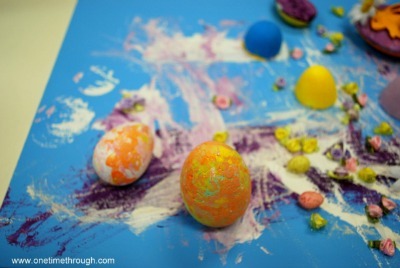 Foam eggs are super fun projects for kids and even adults too! I like painting them even when it’s not Easter yet. Great stress buster for me.